Or... How can I get my chameleon to lay her eggs?! So often we think that we are so brilliant and that something as simple a getting a chameleon to properly lay her eggs should be relatively simple. Then you meet the chameleon from, well, another place. No matter what you do she isn't satisfied with the place you have provided her to lay her eggs. She is found rooting in the hanging plants or pacing the floor of the cage, completely avoiding that lovely pail of dirt you have placed into the cage with her. It seems like a perfect spot to you and yet she will walk over it, into it and maybe even take a moment to rest on it! But the concept of using it to lay her eggs has eluded her completely! Chameleons have never had a reputation as easy or simple reptiles to care for so why would the process of depositing eggs be any different? I do think at this point I should clarify that I am not talking about a chameleon that is having egg-binding problems. I am talking about a female chameleon that has a very clear concept of where she wants to lay her eggs and you have not provided it ... yet. So, don't despair, you are not alone in dealing with this situation. It is just one of the many challenges that draws people to these fascinating reptiles. The first step in creating the right nesting situation is to think like a chameleon. Have I lost you? Well as strange as the statement sounds you do kind of have to think along the lines of what is she looking for. I have found that the best way to do this is to go to the source of their environment. If you can approximate their natural environment, you will increase the chances of getting the situation right for her to lay her eggs. 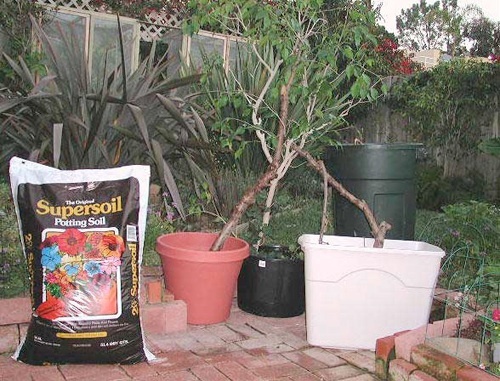 Oviparous or egg laying chameleons need the correct medium in which to lay their eggs, I use Supersoil, a fertilizer-free potting soil, as the medium for the nest site. I have found this to be acceptable for many different species including Ch. calyptratus, C.parsonii, Ch.melleri, F. paradalis, Ch.quadricornis, Ch. weidersheimi, Ch. johnstoni and B. fisheri as a good sampling to indicate a diversity of species. I find that the soil needs to be reasonably packed and slightly damp, enough so that when the chameleon digs into it, it will hold up and allow a tunnel to be made. The soil should never be wet or soggy. Setting up a container for a nesting site is fairly simple. You need a container that is large enough for the female to get into to dig and make a tunnel. Depending on the species this may only require a shallow container of 6 to 8" deep and 10 to 12" across for Ch.weidersheimi to a 20+-gallon hamper, 24 to 36" across for something as large as C.parsonii or Ch.melleri. I fill the container to a few inches from the top with the soil and pack it down so that it isn't too easily moved but not hard packed. Next, I cover the soil with dry leaves to simulate the natural forest leaf litter. If I am dealing with an extremely shy species, I may also plant a small ficus tree in the container for additional coverage before adding the leaves or grouping some potted plants around the container also can be helpful in providing cover. The final step is to place several appropriate sized branches into the soil leading up into the trees/plants in the cage, allowing the female easy access to the container. The above picture shows the items put together. The items are shown outside a cage for clarity. All these items and the female should be inside a cage! The thing I like best about this type of setup is that it lets you put the nesting site into the females cage avoiding any additional stress of having to move her into a new situation. The females will still roam around their cage exploring it for a nesting site but I have always found this set up to result with the female accepting it as suitable. I have used this type of set up on all the above-mentioned species with great success. The chameleons seem to utilize it with little or no hesitation. Now that I have said that, I am sure there will be a bunch of people to let me know otherwise! Well, that's life with chameleons, as soon as you say it is a proven method, someone lets you know ... their female didn't go for it! What can I say but Good Luck! Ken Kalisch has worked with over 40 species of chameleons in the last decade. He was co-editor of the Chameleon information Network, as well as being published by Advanced Vivarium Systems dealing with his experience breeding Calumma parsonii parsonii in captivity. He was the editor of this CHAMELEONS! EZine from March 2002-March 2004.